Saskatoon Capitol Theater Wall-Hanging, Artifact ID WDM-2018-S-29, Western Development Museum Collection. The Western Development Museum (WDM) is the largest human history museum in Saskatchewan. We are a network of four museums in four cities (North Battleford, Yorkton, Saskatoon, and Moose Jaw, with a Corporate Office in Saskatoon). As Curatorial Assistants at the Corporate Office, we routinely handle artifact donations and public inquiries. Alex works with the public on their prospective artifact donation offers, while Kaiti works with the donated items once they’ve been accepted into the WDM collection. Often, the WDM receives offers of items that are over-represented in our collection such as sewing machines, pianos, pump organs, and wedding dresses. We tend not to accept them, as we are looking for items that tell a uniquely Saskatchewan story. 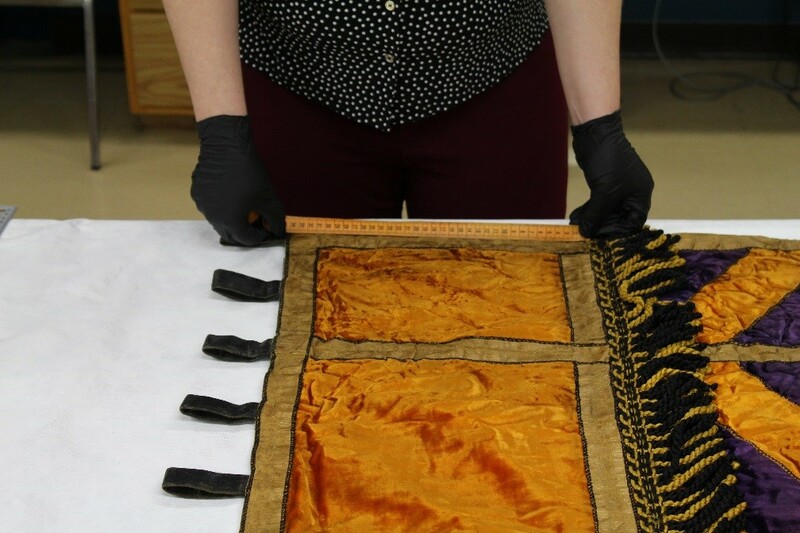 To give some insight into the journey of an artifact from its initial offer through to its acceptance into the collection and to final storage at the WDM, here is the story of a wall hanging from the former Capitol Theatre in Saskatoon (built in 1928-29 and demolished in 1979). Our acquisitions process is guided by the WDM’s Strategic Plan and Collections Management Policy. Decisions about whether to accept an item or not are determined by criteria set out in our policies. The WDM also intends to develop a Collections Development Plan to further standardize the acquisitions process. The Collections Development Plan will set out specific guidelines for how to enact the Collections Management Policy over five years. 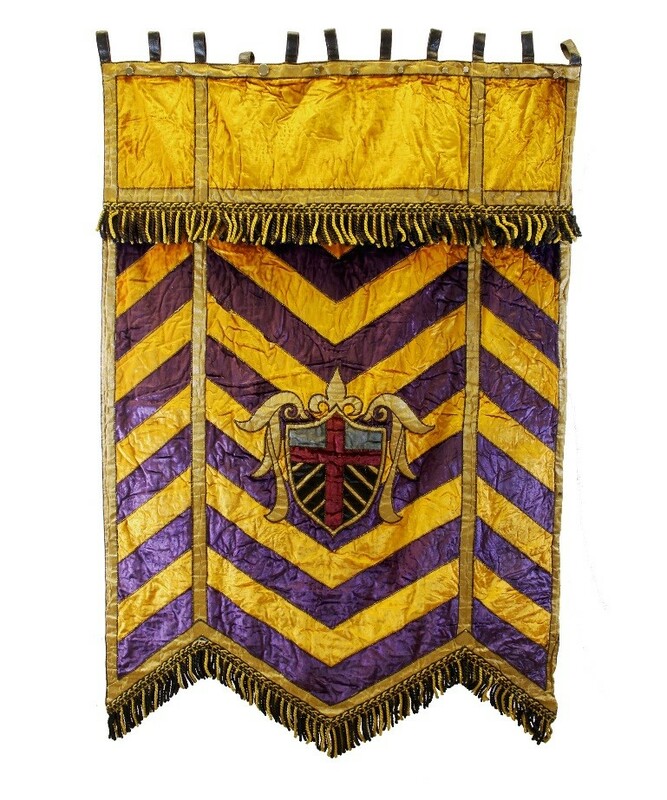 A donor contacted us in November 2018 about whether we would have interest in a banner that had once hung in the Saskatoon Capitol Theatre. Any items that meet our criteria are taken to our acquisitions committee, which determines whether an artifact is suitable for our collection. Hillyard, Leonard. 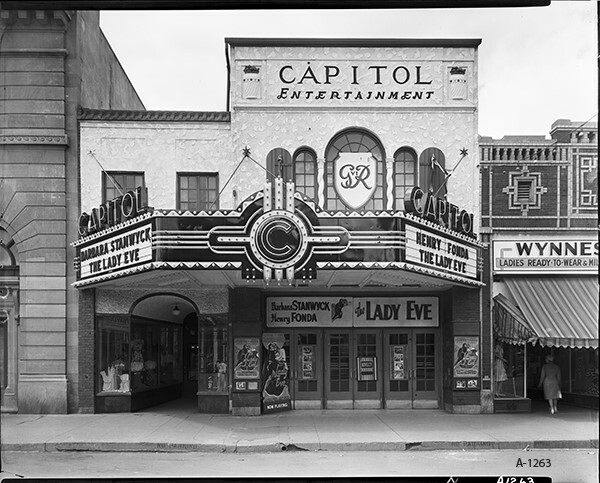 Exterior of the Capitol Theatre, 1940s. Courtesy of Saskatoon Public Library Local History Room A-1263. Before taking a prospective acquisition to our acquisitions committee, Alex asks: What does the donor know about the item? What is the physical condition of the item? What is/was it used for? Who owned it? When was it manufactured? Alex also needs to determine if an item will bring something new to the Museum collection. Documentation is helpful when gathering this information. Examples of common documentation include photos of the item being used, letters, newspaper stories, certificates, and receipts related to the item. These sorts of related documents help us interpret and understand the item’s significance and how it might fit into our collection. Many items are refused at the time of initial offer. Typically, this is because they are items that are already well-represented in our collection, there is little-to-no known history behind an item, it does not have a connection to Saskatchewan, or the item is in poor condition. Is it historically significant? If so, how? How does it relate to Saskatchewan? Was it made or invented in Saskatchewan? What condition is the object in? Are there any considerations for conservation or concerns for long-term care? Does it highlight under-represented communities in Saskatchewan history? The banner under study here is from the Capitol Theatre in Saskatoon. The Capitol Theatre opened in 1929 and was located on 2nd Avenue near 22nd Street. 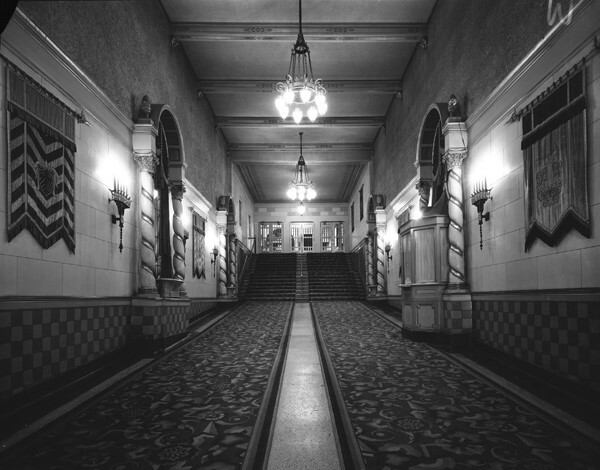 It was one of the first theatres in Saskatoon to play “Talkies,” that is, movies with audio. It was a valued landmark in Saskatoon and its demolition on December 1, 1979 was done in the middle of the night to minimize protest. The destruction of the building caused great controversy in the city, with many seeing the demolition as a regrettable decision that unnecessarily eliminated an important heritage building. This photo from the Saskatoon Local History Room show the banner hanging in the building in 1950, 29 years before its demolition. Hillyard, Leonard. Interior View of the Capitol Theatre, June 1950. Courtesy of Saskatoon Public Library Local History Room A-2050. Once an item like this has been accepted at the acquisitions committee meeting and the donor has officially signed it over to the museum, it becomes an artifact in our collection. The item is then assigned a unique identifier called an accession number, is labelled with that accession number, and is then handed over to Kaiti to catalogue. Assigning an accession number. Photo by author. When an artifact first comes to Kaiti from Alex, her primary task is to document and do more in-depth research on it. It is important to know as much of the history of a specific artifact as possible. When Kaiti received the banner, she expanded upon Alex’s research on the history of the Capitol Theatre in Saskatoon. She also researched other Saskatchewan movie theatres in the late 1920s and early 1930s. Learning more about this specific banner required collecting oral histories from the donor, whose father-in-law and grandfather-in-law had both worked in the theatre since the 1930s. Measuring the artifact for the record. Photo by author. After completing this background research, Kaiti writes a detailed description of the artifact. It is important when documenting the artifact to describe it in enough detail that it could be identified even if all photographs of the item were lost. Kaiti’s description for this banner was about 500 words long; some descriptions can exceed 1000 words! Kaiti also writes a condition report for the object. 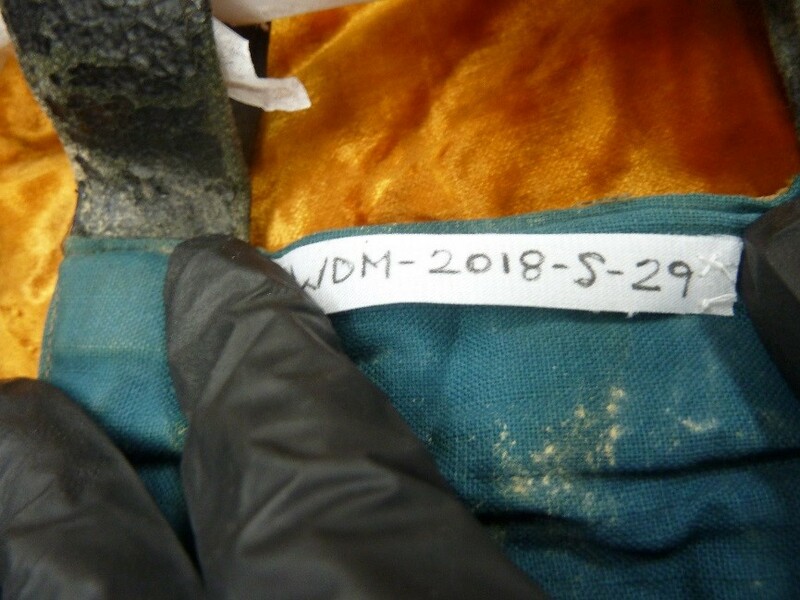 Condition reporting allows us to know what parts of the artifact require restoration and keeps track of any deterioration that occurs to the item while it is in storage or on display in the Museum. We also take photos of the artifact to store in our database. Once documented, Kaiti checks with our Conservator, Mark Anderson, to see if the banner requires any special care before being placed in storage. In this case, he suggested vacuuming the artifact to remove dust, insect remains, and particulates, which pose a risk to the health of the artifact. 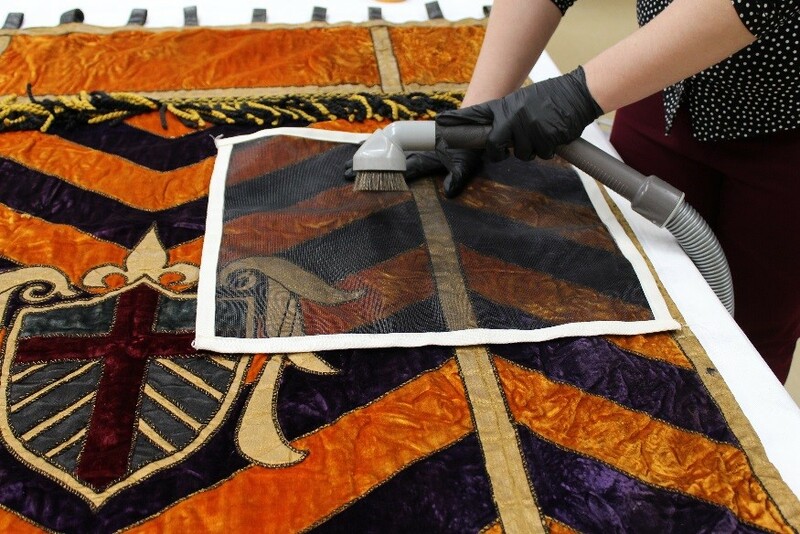 We vacuum an artifact using a screen to prevent any loose pieces of the artifact (threads, tassels, or pieces of fabric, for example) from being pulled off. Vacuuming the artifact with a screen. Photo by author. After vacuuming, Kaiti consulted with our Conservator again to determine how to properly store the artifact. This often requires building custom boxes or mounts for items. For this item, his advice was to store it flat rather than rolled or hanging. The banner is heavy enough that hanging would put stress on the seams, and it was too thick to roll. In addition to this, the embellishments on the banner could be damaged if it were rolled. Kaiti had to find space in our storage to hold it, but none of our flat storage shelves were large enough, so, she constructed a box for it. The box was made with a special, acid-free cardboard, and is unique to the artifact. Once the box was made, Kaiti affixed labels to the box with the accession number to easily identify it and moved the box to storage. The artifact in its custom-made storage box. Photo by author. Documenting an artifact’s location is one of the most important tasks Kaiti does. With almost 80,000 artifacts in our collection, it is vital that we keep track of where everything is stored! We document the artifact’s location in our computer database and keep a paper copy in the artifact’s physical file. This banner represents the history of a Saskatoon landmark as well as a broader history of the city itself. It contributes to a sense of belonging and identity for long-term Saskatoon residents and can teach the history of heritage buildings to newcomers to the city as well as younger generations. The banner is a remnant of the Capitol Theatre that can provide insight into urban, social, and cultural aspects of the past. 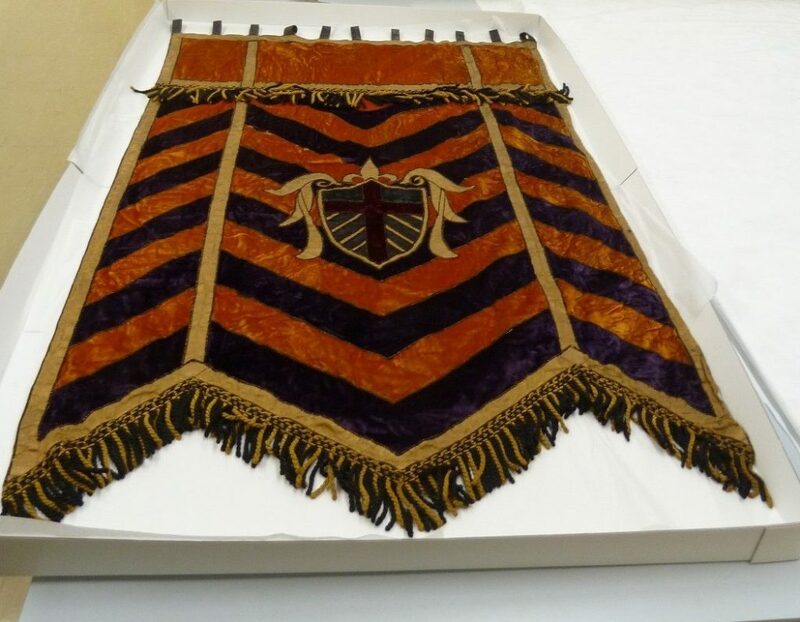 Tracking the banner through the acquisitions process illustrates the complexity of the considerations taken when an artifact is accepted into the collection. Examining this process helps us better understand why it is necessary to be selective in our acquisitions procedures. Artifact acquisition isn’t a quick process. The acquisitions process can take anywhere from three weeks to several months depending on the concerns surrounding the potential donation. Each artifact we accept requires many resources (like space, time, and money) to adequately prepare it for storage and to conserve it for the future, so we must carefully consider which donations we accept. Having guidelines such as the Strategic Plan and Collections Management Policy help govern our decision-making processes to ensure resources are used responsibly. Many people don’t realize how much work goes on behind the scenes at a museum. This disconnect can leave visitors or potential artifact donors feeling confused, disappointed, or left out of the process. Sharing information like this is one way we hope to demystify the donation process and bring to light some of what goes on outside of the public eye. : See for example, the British Museum, the Louvre, the Field Museum, The Metropolitan Museum of Art and the Boston Museum of Fine Arts, and many other museums. Kaiti Hannah is a Curatorial Assistant at the Western Development Museum. She holds an MA in Public History from Western University. Alex Emery is a Curatorial Assistant at the Western Development Museum. She holds a BA in History from the University of Saskatchewan.